How Miami Residents Are Adapting For Climate Change In Miami, the effects of global warming are not hypothetical predictions but realities of everyday life, prompting change by government, businesses and individuals alike. 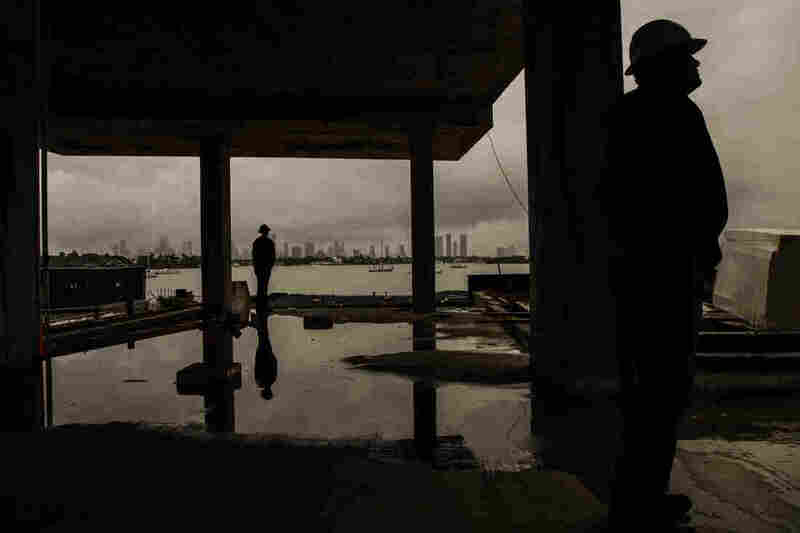 A construction worker at the Monad Terrace luxury development, a high-rise in Miami Beach that has been designed to withstand several decades of climate change and sea level rise. 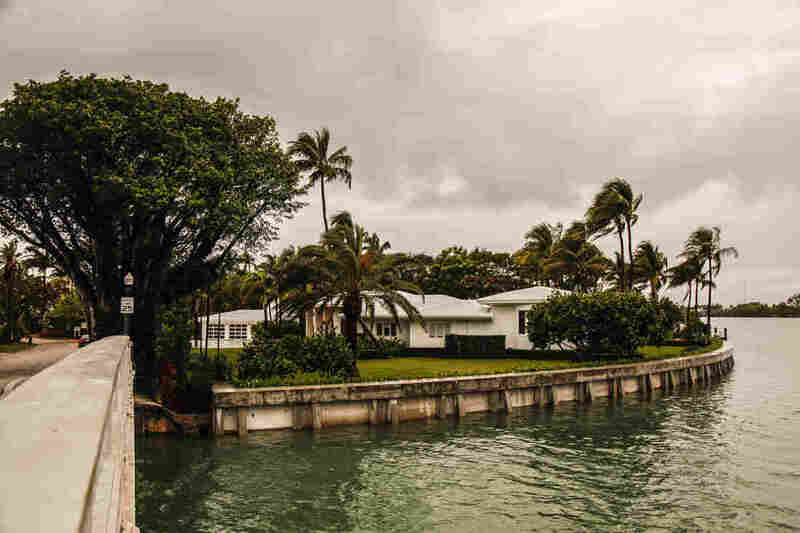 Miami is projected to face anywhere from 1 to 3 feet of sea level rise by 2060, and as sea levels rise, higher ground inland has started to look more and more desirable. Much of that higher ground is in the city's poorest neighborhoods, like Liberty City and Little Haiti. As Bryant puts it, it has turned land in these communities into "caviar." 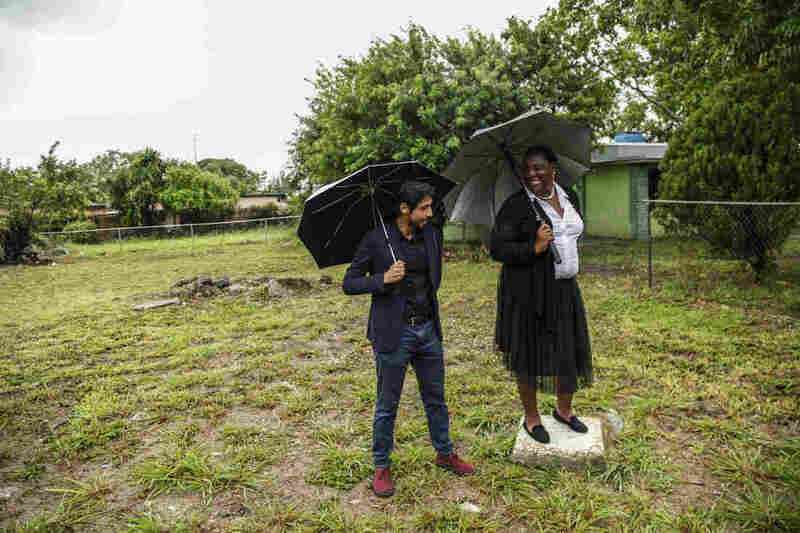 Adrian Madriz (left) with Trenise Bryant at the site of their planned community land trust and apartment building in Miami's Liberty City neighborhood. They say the project will provide housing for low-income locals and help resist so-called "climate gentrification." The shifting real estate landscape is just one example of how, in Miami, the effects of global warming are not hypothetical predictions but realities of everyday life, prompting action by government, businesses and individuals alike. 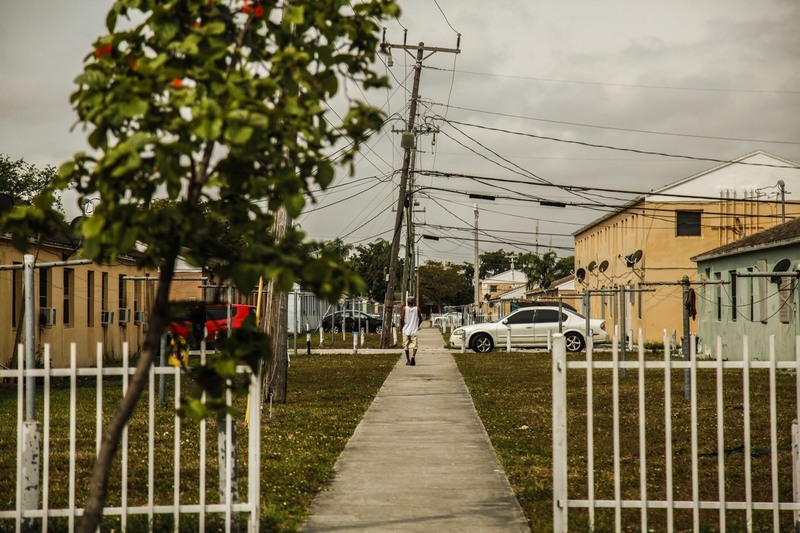 Across the region, developers are changing how they build, wealthy homeowners are reinforcing their properties, and in communities that are farther from the coast — places like Liberty City — residents are working to make sure they don't have to leave their homes. Experts say no single factor can account for rising property values. 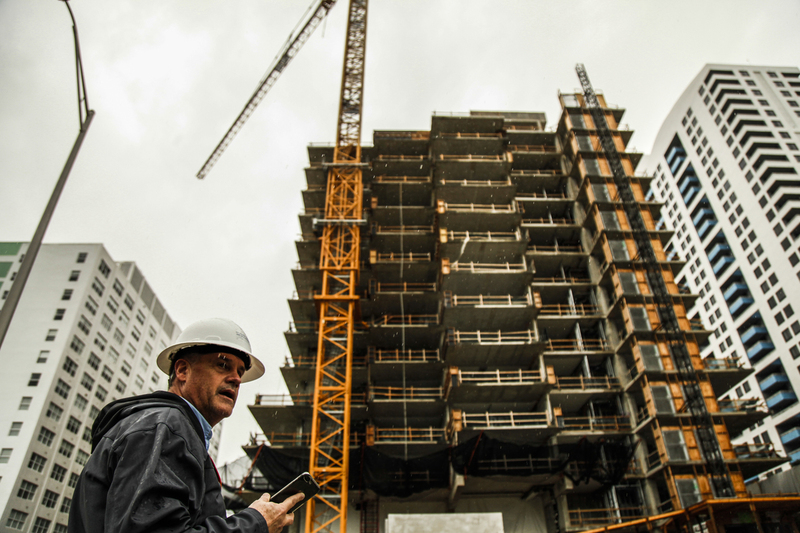 But as the risks of climate change have come into clearer view, researchers like Jesse Keenan of Harvard University have begun to take note of what is being called "climate gentrification." In one study, Keenan and his colleagues found that from 1971 to 2017, real estate at higher elevations in Miami appreciated at higher rates than properties closer to sea level. Their findings held true in 24 of the 25 jurisdictions that they studied. It's an issue that Miami officials are paying attention to as well. Last fall, the city adopted a resolution to study "gentrification that is accelerated due to climate change." The city has also earmarked $100 million from its $400 million Miami Forever bond for affordable housing. "Miami is a fiscally conservative city, and while we have great wealth, we also have the majority of our population struggling to make ends meet," says Jane Gilbert, the city's chief resilience officer. That's especially true in Liberty City, the backdrop to the Oscar-winning film Moonlight and an area where almost half of households earn less than $20,000 a year. Some residents of Miami's long-underserved Liberty City neighborhood are worried that climate gentrification will drive rents up and force them to move from their homes. Given those demographics, activists like Bryant have begun working to make sure the neighborhood remains affordable. The goal is to create more community-owned housing through what's known as a community land trust. To do so, Bryant connected with Adrian Madriz of the group SMASH — Struggle for Miami's Affordable and Sustainable Housing — to develop an apartment building in Liberty City that will be owned and operated by locals. Bryant and Madriz already have a site — a small plot of land donated by Bryant's husband — and they've posted a rendering of the project out front. It shows a two-story building with one unit for extremely low-income renters, one unit of transitional housing for LGBTQ youth and a market-rate apartment that will help subsidize the project. The building, which they plan to break ground on later this year, is expected to cost about $325,000. "It is definitely a race against time," according to Madriz, who says the city has been slow to engage underserved communities in discussions about climate change resilience. "We should have been having this conversation 10 years ago." Nevertheless, he's hoping their efforts can become a blueprint for other communities facing similar circumstances. "I think we do have an opportunity to be a bit ahead of the curve when it comes to what kinds of policies are implemented," says Madriz. "We'll hopefully ... have good and solid and decent-quality places for people to live without having to worry about if people are really going to survive the effects of sea level rise and climate change." Diane Walder and her husband have raised their sea wall and renovated their home to protect against stronger hurricanes and rising sea levels. While neighborhoods like Liberty City are bracing for accelerating gentrification, developers and homeowners on the coast are adapting in other ways to the growing danger of rising seas. Diane Walder has lived in her home for 30 years. It has huge windows that look out over Biscayne Bay and a manicured lawn dotted with palm trees. In the past few years, she and her husband have watched the jade-green waters creep higher and higher. The rate of sea level rise in South Florida has tripled in recent years, exacerbating tidal flooding. To cope, Walder and her husband replaced their old sea wall, adding several feet to hold back the rising waters. Walder declined to say how much raising the sea wall cost, but contractors say this kind of project can easily top a quarter-million dollars. Walder and her husband also strengthened their roof and replaced their windows and doors with hurricane-proof glass. "That's the price you pay to live here," Walder says. Diane Walder says she's not a "global warming scaredy-cat." 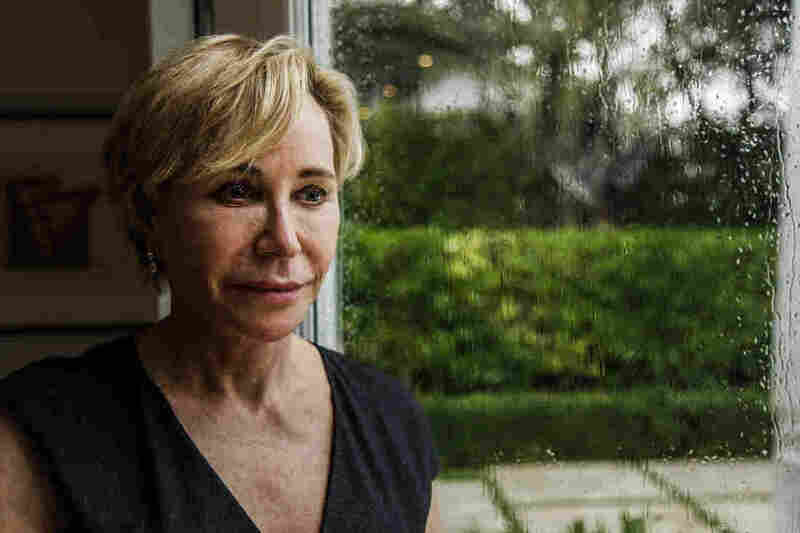 But she says she has noticed sea levels rise around her waterfront home in Miami Beach. Meanwhile, she says her two kids want her to move away from the water. They send her stories warning about how her part of the Miami region will be uninhabitable by the end of the century. But Walder says she's not a "global warming scaredy-cat" and has no plans to leave. She questions the firmly established scientific consensus about the connection between human activity and climate change. "We've had ice ages and all sorts of other things — droughts, famines. We really have very little control over that," Walder says. "I can't predict what's going to happen in 100 years. I'm not going to be here in 100 years." What that future looks like depends largely on how quickly the world reduces carbon emissions, says John Englander, an oceanographer and sea level rise expert. But he warns that changes to our way of life are already inevitable. "As sea level rises foot by foot and it becomes clear that we can't stop it ... we're going to have to change our concept of the shoreline and realize we can't save everything we'd like to," Englander says. 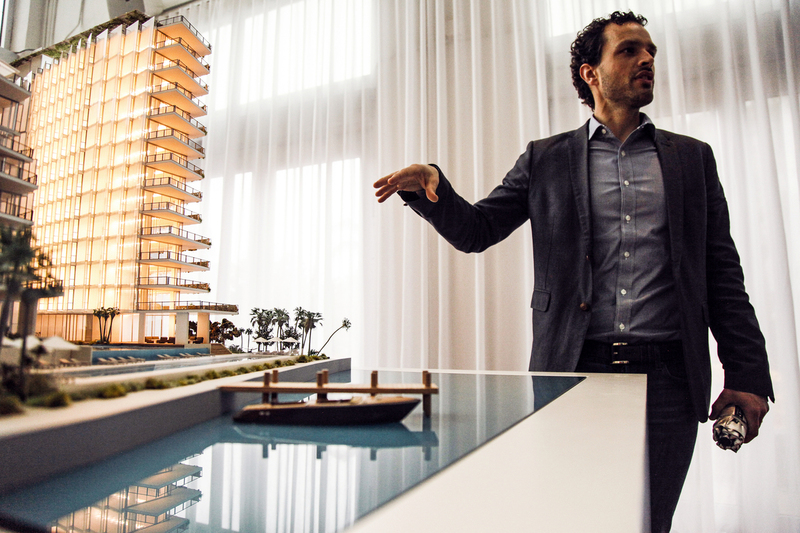 Simon Koster of JDS Development Group points to a model of the Monad Terrace luxury development, which is being built with climate change in mind. For developers like Simon Koster, that new shoreline will be made up of more resilient structures, like the Monad Terrace luxury apartments he has helped build. It's a massive complex that sits just feet from the shore. Apartments range from $1.5 million to $14 million for a rooftop penthouse, and Koster says most prospective buyers are people who already live in the Miami area — people who are looking for a comfortable and secure place to call home. "It's very easy for someone who doesn't live here to say we shouldn't build here or we should go live somewhere else," Koster says. "But this is an absolutely responsible, resilient place and way to live in a place that people already love." Apartments at Monad Terrace range from $1.5 million to $14 million for a rooftop penthouse. Koster says most prospective buyers are people who already live in the Miami area. Koster says climate change isn't the first thing his buyers ask about, but they do always ask about it. At the construction site, he explains how Monad Terrace is designed to address their concerns: The base of the building is 12 feet off the ground, and a landscaped ramp will lead residents up and away from future floodwaters; the basement is a sealed concrete "bathtub" built to keep water out; a massive generator is on-site for power outages, as are pumps to deal with floodwaters; and the building is clad in glass that can withstand a Category 5 hurricane. But Koster acknowledges it still may not be enough in the long term. At the construction site, Koster explains how Monad Terrace is designed to address buyers' climate change concerns. The base of the building is 12 feet off the ground, and a landscaped ramp will lead residents up and away from future floodwaters. "There is certainly going to be sea level rise, and the debate can be [about] how many feet [it] is going to be, but it's certainly going to happen." Asked if Monad Terrace is being built with the next 100 years of climate change and sea level rise in mind, Koster pauses. "It's probably a little bit less than that, quite frankly."